“God seems to have graced some living things more abundantly than others. He was particularly generous to pelagic birds. Our days between Ushuaia and South Georgia on the open waters of the South Atlantic Sea provide ample evidence of this. Storm Petrels are a case in point. They dash across the sea like frenzied ice skaters, like Bolshoi dancers. They stop in place and dap their toes into the water like ballerinas en pointe. They careen off again, rolling back and forth, back and forth. Watch them closely enough, long enough, with sure and agile enough tracking, and they will reveal their identity by way of their belly plumage: dark for Wilson’s, white with a black streak for Black-bellied. But it is the stiff-winged albatrosses that to me best reveal the sea birds’ special grace. The first species we encounter is the lovely Black-browed, with its snowy white head and stunning black stripe through the eye. These birds wheel and glide behind the ship showing off their natty black and white plumage from all angles. Later we see Light-mantled Sooty and Gray-headed Albatrosses as well, each with equally pretty plumage. They are much rarer than the seemingly ubiquitous Black-browed, however, and for that reason seem more precious. Soon the Wandering Albatross appears. We see mostly immature birds of this species, which even in the adult plumage is somewhat drab when compared with the other albatrosses. But this bird’s blessings are not cosmetic, not skin-deep. The Wanderer possesses unimaginably efficient wings. Wings capable of keeping the bird airborne day after day after day, almost never needing to be flapped. Wings sensitive to the slightest nuance of wind, of updraft, of gradients in the boundary layer. This species’ grace and beauty are functional, structural, geometric, aerodynamic. This bird is the consummate flier, with slender sail-plane like wings that can bring tears of joy to the eyes of an aerodynamicist. Occasionally bestowing on us a close look as they glide over our heads, these huge birds with their eleven foot spans more often skim the wave tops one or two hundred meters away. They are nearly always within sight of the ship, but not tethered in its wake like their molly-mauk and petrel cousins. 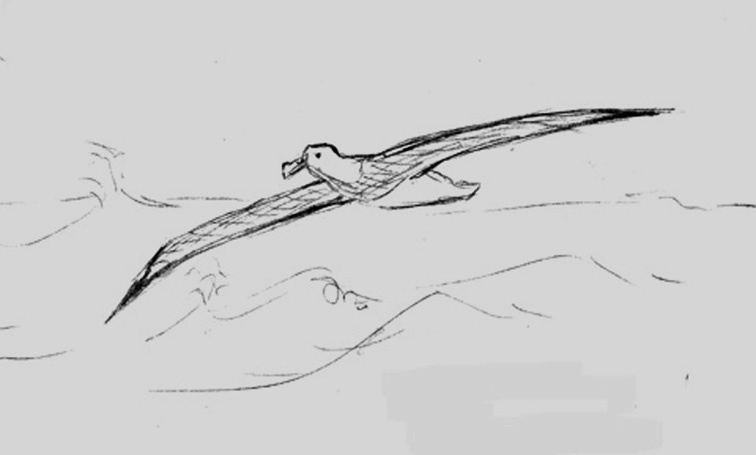 I have dreamed of seeing the Wandering Albatross for years, since reading The Rime of the Ancient Mariner as a child. My desire only intensified when I became an engineer and read the works that document the astounding feats performed by Diomedea exsulans. 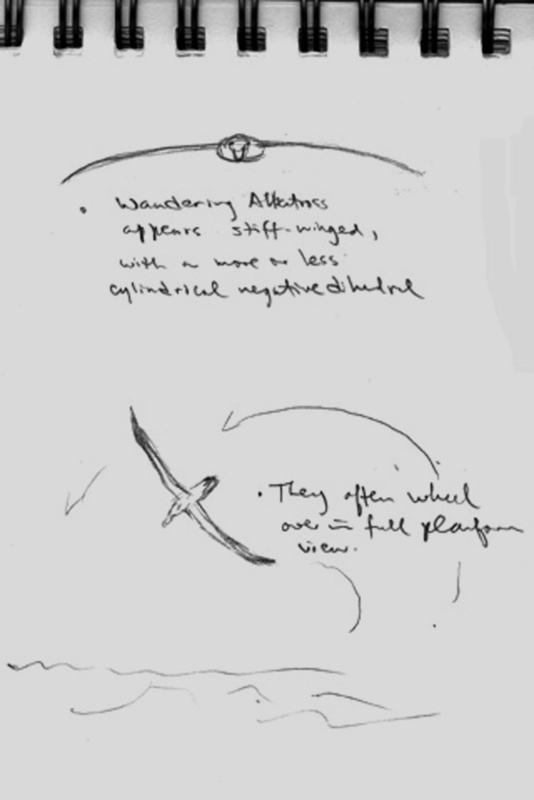 In 1964 Clarence Cone of the Virginia Institute of Marine Science published a mathematical analysis of the energetics of dynamic soaring that showed albatrosses to be the original wind machines, able to extract energy from wind and wave with the clarity, precision and unerring control with which they maintain their attitude and position in time and space. 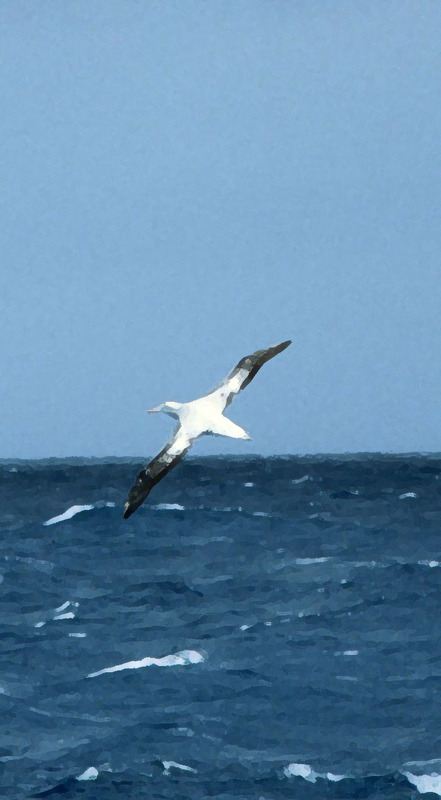 In 1982 Colin Pennycuick made field observations of the gliding performance of the albatrosses of South Georgia and quantified their impressive performance. 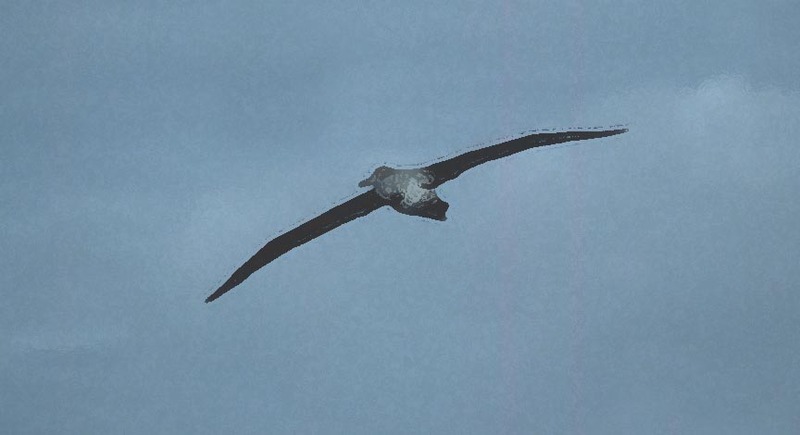 P. Jouventin and H. Weimerskirsch tracked Wandering Albatrosses using satellites in 1990 and determined that the birds made foraging flights away from their nests of from 3 to 33 days that covered from several thousand to 15,000 kilometers. Credible documentation of incredible feats. Now I stand at the stern of the Akademik Ioffe, shifting my weight from leg to leg as the ship lifts and rolls on the swells of the Drake Passage, the wind whipping my cheeks with spume plucked from white-fringed waves. The surface of the sea is almost alive, in constant motion. I stand and watch them: Real albatrosses. Live albatrosses. Albatrosses sharing with me this position in time, this position in space, this raw and lovely intersection of nostalgia and reality. My travel journal entries from a trip I made 15 years ago to Antarctica have long been posted on my web site http://www.windsofkansas.com. I have decided to extract some of them and post them here on my blog so that they are exposed to a different audience. The text and rough sketches are from my Antarctic Journal. The schematic diagram is from the cover of “A Mathematical Analysis of the Dynamic Soaring Flight of the Albatross with Ecological Interpretations,” by Clarence D. Cone, Jr., Virginia Institute of Marine Science Special Scientific Report No. 50, May 1964. 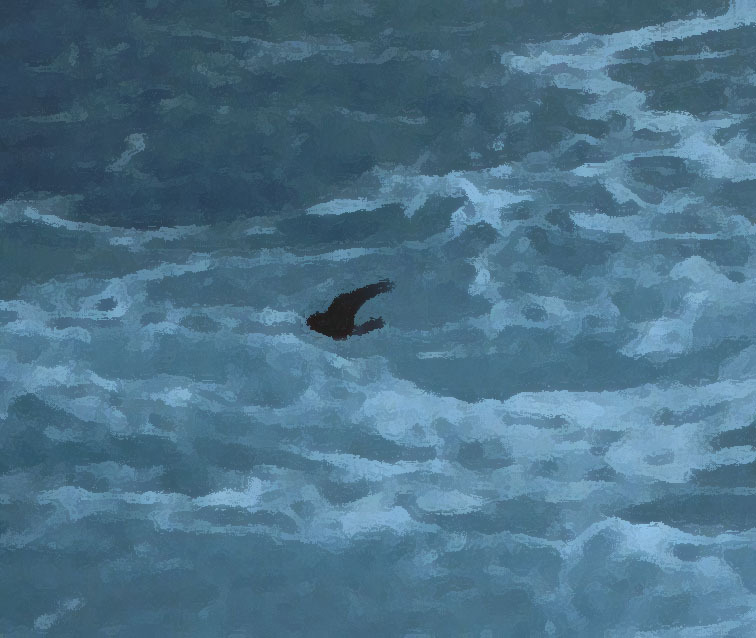 The color images are from photos I took on the 1998 Antarctic trip and are of a Wilson’s Storm Petrel and two different Wandering Albatrosses. I used Photoshop filters to make the photos look like paintings.